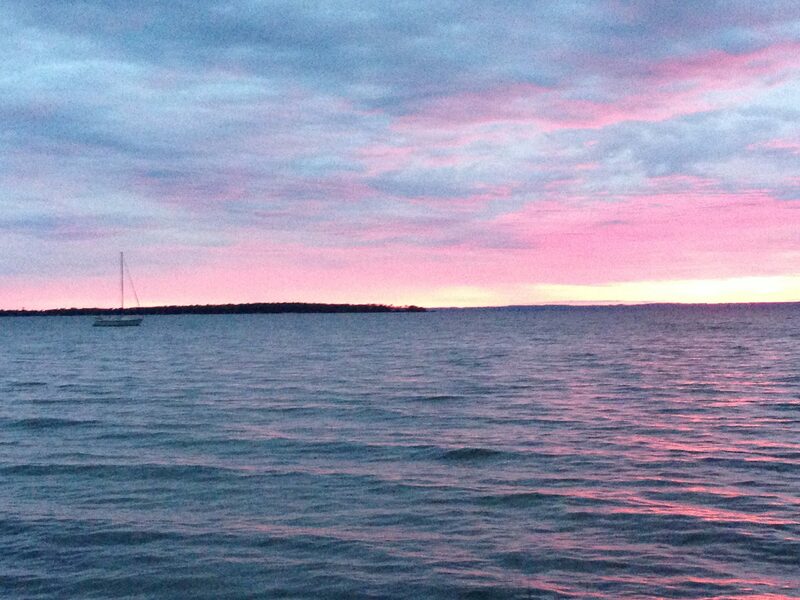 How does coastal flood risk impact home prices? The answer depends, in part, on how buyers and sellers perceive flood risk. Consider the following thought experiment: how much more is a house on the coast with no flood risk worth than a house on the coast identical to the first except with a high flood risk? Attentive individuals would be willing to pay less for the latter home, given expectations of future flooding and associated damage. More attentive individuals, cognizant of historical and future sea level rise, would also incorporate expectations about future changes in flood risk. However, if individuals do not consider flood risk, or perceive the risk to be equivalent across the two homes, they would pay the same amount for either house. Thus, if people have differing beliefs about current and future flood risk dynamics, market prices may no longer reflect the true underlying risk, potentially leading to inflated coastal home prices. In a recent NBER working paper, Lint Barrage and I examine the potential impact of heterogeneous beliefs about flood risk on housing market price dynamics, given a hypothetical increase in flood risk. We began with a theoretical model to estimate coastal and inland housing prices when individuals have differing beliefs about flood risk. In order to calibrate the model with real-world data, we undertook a door-to-door survey in Rhode Island to ask coastal residents (living within 400 feet of the waterfront) and non-coastal residents in the same communities a variety of questions including their valuation of waterfront living and their perception of coastal flood risk. In the survey, we found that people had varied beliefs about the likelihood of coastal flooding and how worried that made them. 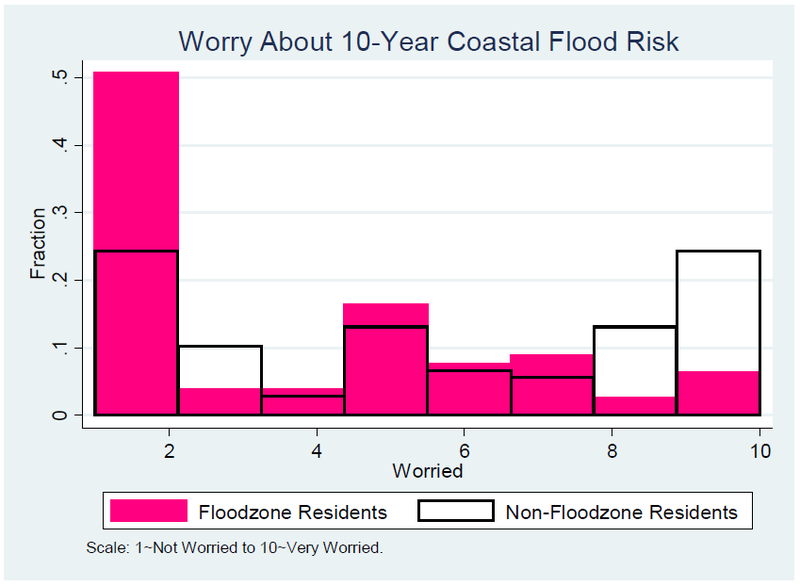 As shown in Figure 1, we found that residents living in coastal flood zones were systematically less worried about coastal flood risk relative to those outside flood zones. This is intriguing as those living in the higher risk zones were actually less worried and these differences were not driven by differing expectations of total damages, insurance payouts, or public assistance. We also had coastal residents assess the flood risk of their own homes. 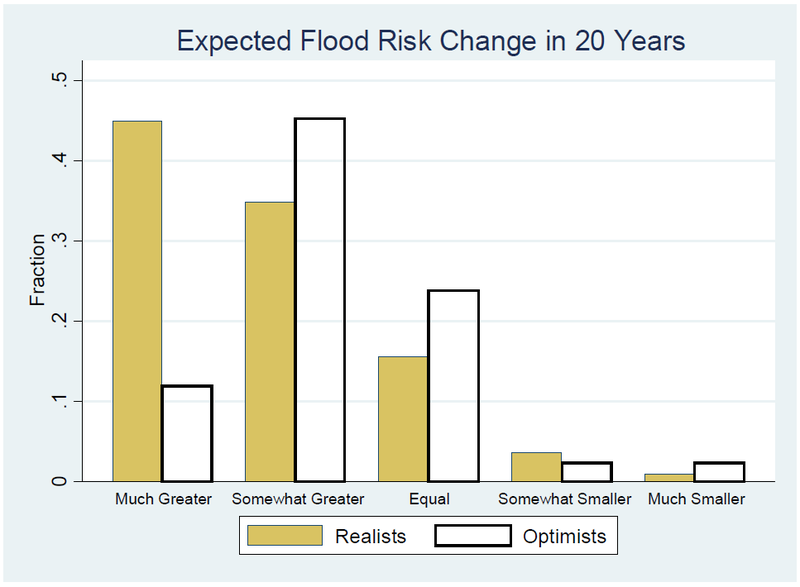 Based on these findings, we broadly categorized individuals as either realists, who accurately perceived their own home’s flood risk (based on modeling), or optimists, who underestimate their own flood risk by at least 50%. Important, too, are expectations of future flood risk. In a follow up question, we asked residents how different they thought coastal flood risk would be in 20 years, relative to today. Figure 2 presents these results. We found that while a majority of individuals expect future flood risk to increase, optimists, on average, viewed future inundation risk to be lower that realists. We use these and other real-world data to calibrate our theoretical model and simulate the impact of variations in beliefs about flood risk on coastal housing market prices, given a hypothetical 1% increase in flood risk. We find that a small number of people with optimistic beliefs about future risk can lead to inflated coastal housing values and larger price declines as beliefs converge. With 45% of market agents as optimists, home prices would fall 16% to their future fundamental value, compared to a 3% price decline in the fully realist case. To put the results in context, the median U.S. home sale price fell by about 19% during the Great Recession in the late 2000s. The findings have two important policy implications. First, high quality flood risk maps and projections of future sea level rise are key ingredients for the health of housing markets. A lack of reliable information makes it difficult for residents to accurately assess their flood risk. Second, these results raise the question of how residents’ risk beliefs may converge in the future. One mechanisms that could potentially do this is mandatory, risk-priced flood insurance. Under such a case, individuals would fully internalize their property-specific flood risk through annual insurance premiums, regardless of their individual beliefs. That is, the price of the insurance—which reflects the true risk—would be capitalized in housing values. While public insurance through the National Flood Insurance Program is currently mandatory for those in high flood risk areas, uptake remains low and, in many cases, insurance premiums are below the actuarially fair risk-based rates. Thus, while National Flood Insurance Program reforms could help solve program solvency issues and increase resilience, it will also have important distributional consequences as well as implications for the health and stability of coastal housing markets.